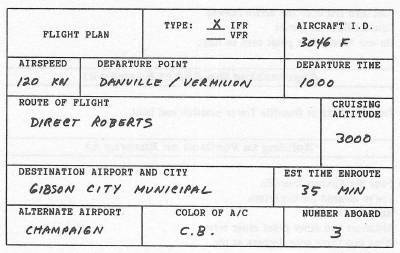 While dropping off your three passengers at the Butler terminal building, the dispatcher calls you aside and asks for a favor: A young physician who is due to make a presentation at a conference over in Gibson City arranged for an air-taxi flight, but his original carrier has been delayed. He's running out of time, so you gladly agree to fly him over yourself. You quickly get an update on the weather and file IFR. The weather remains unchanged: The wind is still generally from the southwest, and you can expect actual IFR conditions and low ceilings throughout the Southern Illinois area. The logical route is directly back to the Danville VOR (about 9 miles) and then direct to Roberts (38 miles). 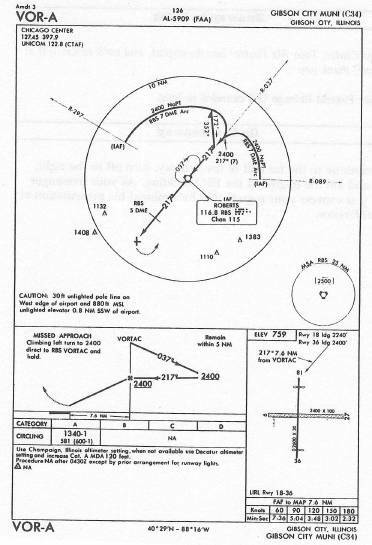 It's about 8 more miles from Roberts to the airport, but you'll undoubtedly be covering that distance on the VOR-A approach, which is the only instrument procedure available for Gibson City. Squawk three one two zero. On one twenty-four point zero so long. Four Six Foxtrot Danville Tower position and hold. Climb and maintain fifteen hundred. Climb and maintain two thousand. On one twenty-one point three five good day. On one twenty-seven point four five and have a nice day. Expect to hold at Roberts. Expect the VOR-A Approach to Gibson City. The Champaign altimeter is two niner point niner five. You've been holding at 3000, so you proceed outbound from the VOR to execute the procedure turn while descending to 2400. Low level scud, perhaps in combination with the effects of the nearby thunderstorms, is causing Gibson City to fall below minimums. Missed approach: You're at your decision point but you don't have the runway in sight. You level off, raise the flaps and landing gear, add power, and start a shallow left turn to begin the prescribed missed approach procedure. Chicago Center, Four Six Foxtrot, we have a missed approach. Four Six Foxtrot Chicago stand by one. You indicate your desire to give the approach another try before proceeding to your alternate, and your controller once again clears you for the VOR-A approach. Chicago Center, Four Six Foxtrot has the airport, and we'll cancel IFR at this time, thank you. Four Six Foxtrot Chicago IFR canceled so long. You continue to the far end of the runway, turn off to the right, stop, and kill the engine at the FBO building. As your passenger exits, you express your regrets that he's missed his presentation at the conference.